Looking for a script that clearly teaches Bible truths? Looking for scripts for special holidays? We were too and that's why we put together this script book! Hands 2 Grow now offers a pair of script books to help you and your group share Bible messages with your audiences. 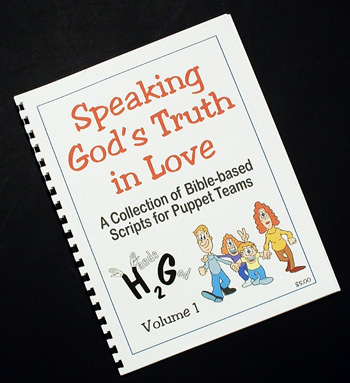 Speaking God's Truth in Love (Volume 1) contains ten original scripts that average 4-5 minutes in length and teach the truths of the Bible in entertaining ways. We have used them often in our presentations and found them to be real audience pleasers that clearly carry the Gospel message of Jesus Christ. Script topics include Jesus and the Little Children, Jesus and the Woman at the Well, Jesus and Zaccheus, as well as thematic skits on Easter (2), Christian friendship, music choices, and more. 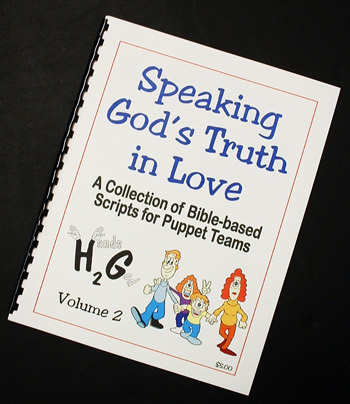 Speaking God's Truth in Love (Volume 2) contains another ten original scripts that average 4-5 minutes in length and teach the truths of the Bible in entertaining ways. We hope the new script book will help fill some gaps and special events not covered in our first script book. Script topics include The Great Commission, A Goliath Problem, It's What's on the Inside that Counts, The Jonah Game as well as thematic skits on Christmas (2), Halloween, Reformation Day, friendship, and more. Cost for a single volume of Speaking God's Truth in Love is only $5 plus a shipping/handling fee of $2.50. You may order both volumes for $13.50 and save a bit on shipping/handling. Please make your check for payable to Hands 2 Grow and mail it (along with your address & the specific volume you are ordering) to . . .